Jay, John (1745-1829) Diplomat, President of the Continental Congress: Jay was admitted to the bar in 1768, and served as clerk of the New York-New Jersey Boundary Commission the next year. As revolutionary sentiments spread across the colonies, Jay took a somewhat conservative view, emphasizing caution and promoting compromise with Great Britain. As a member of the Continental Congress and the New York Provincial Congress, he opposed the Declaration of Independence until after it was officially issued. Having accepted the revolution, he applied himself to the Provincial Congress, particularly the Committee for the Detecting of Conspiracies and the committee assigned to draft a constitution for New York. 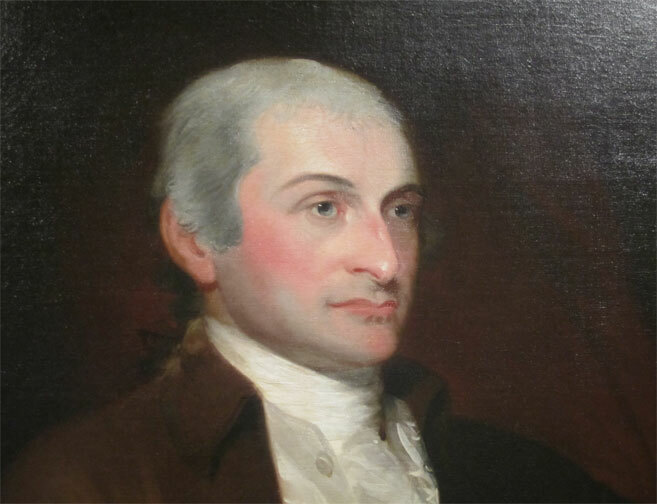 At the Constitutional Convention, Jay helped draft the final version of the 1777 Constitution, and was elected the first Chief Justice of the Supreme Court of New York State. Jay was president of the Continental Congress during one of its most difficult periods, with diplomatic crises, land disputes, and military difficulties. After serving as Minister to Spain, he took his family with him as he joined the American Peace Commission in Paris. In 1782, Jay became Peace Commissioner, joining Benjamin Franklin and John Adams in negotiating with the British. Once a treaty was ratified, he returned home, and was appointed Secretary for Foreign Affairs. He remained in that position until the new Constitution-created federal government appointed him the first Chief Justice of the Supreme Court. Serving as both Chief Justice and minister to Britain, Jay negotiated the controversial Jay Treaty of 1794. The following year, he resigned his position as Chief Justice of the Supreme Court and became Governor of New York. After a second term in office, he retired to his country estate in Bedford New York.